I have a bone to pick with tofu. You know how when you go to a Thai restaurant with your vegetarian friend and he/she orders something with tofu in it and it comes back to the table all beautifully nestled in a vibrant sauce with colorful vegetables and the tofu is in DISGUSTINGLY PERFECT little squares, masterfully crisped and golden brown on all sides with no signs of breakage and then your friend flicks your nostrils for being 2 inches away from her food? That has to be fried, right? Like, deep fryer plunge business? I’m PO’d. First of all, take a look at my tofu in this here picture. All tow up to hayell and back. And the package said EXTRA-FIRM. I never learn. I always buy extra-firm tofu and when I go to open the box, it squishes all up in there like dang mashed potatoes. If it’s going to say EXTRA-FIRM, it needs to BE EXTRA-FIRM. Just like my abdominal muscles. My original plan was to lightly crisp the tofu squares in a little oil before tossing them into the curry. The way in it looks in the restaurants, ja kner? A) How can one cut the tofu INTO little squares when the stupid box crushed it all to smithereens? And B) You should have seen how the sautéing went down. HA FAH-RICKIN’ HA. There was so much sticking and sweating and swearing and hair hurting and utter chaos that I nearly threw it all out in the front yard and served Cymbalta and scotch for dinner. They’re so deep fried, aren’t they? It’s the only way. Even if it looks like my tofu got stomped on by a dinosaur, I need to be straight with you regarding the flavors of this curry dish. 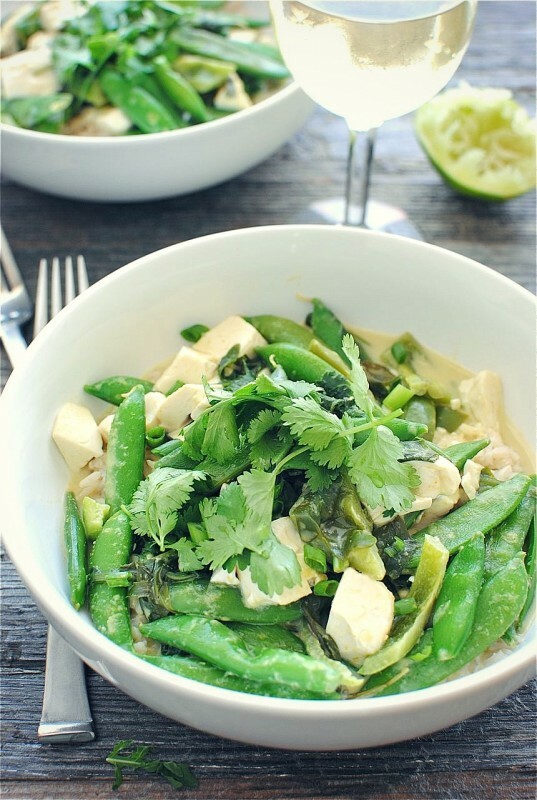 Creamy coconut sauce with a mild but rich green curry flavor, just stop. Crisp-tender veggies that will drop kick your mouth. T-O-N-S of fresh lime juice that will send your esophagus on a joy ride. Nutty brown rice that make your stomach want to make out with it. Grassy herbs that will send your mind into a state of I DON’T EVEN KNOW. And the little tofu sponges soak up all the rich flavors so wonderfully that you’ll forget about the nuclear breakdown that occurred only minutes before. Someone teach me how to open a tofu box. Cook the rice in a rice cooker or your favorite stovetop method. Heat the oil in a medium skillet over medium heat. 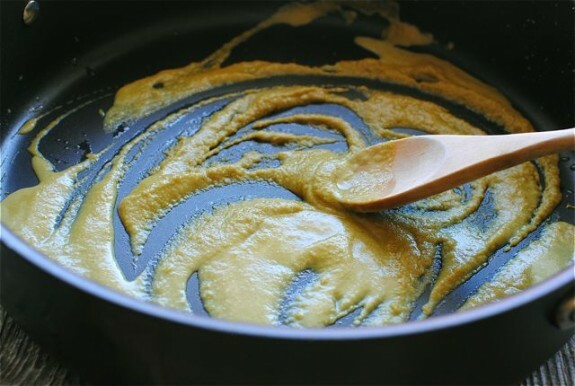 Add the curry paste and press into the oil, blooming for a good minute. 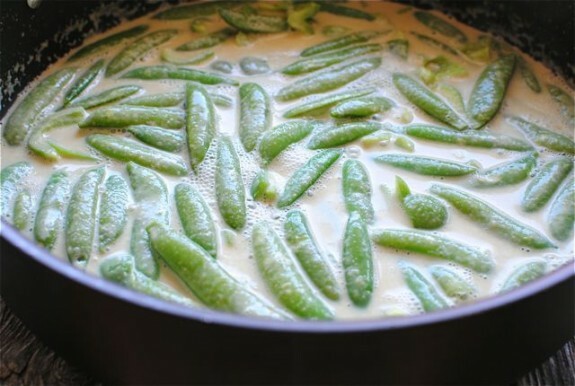 Whisk in 1/4th cup of the coconut milk to combine, then whisk in the remaining coconut milk and bring to a light simmer. Add the snow peas and simmer for 2 minutes. Carefully add the tofu and the green bell pepper. Simmer another 2 minutes. Stir in the arugula and half the scallions. Taste it. Yeah, add some salt and pepper. And while you’re at it, squeeze a gooooood amount of lime juice in. Taste it again. There we go. 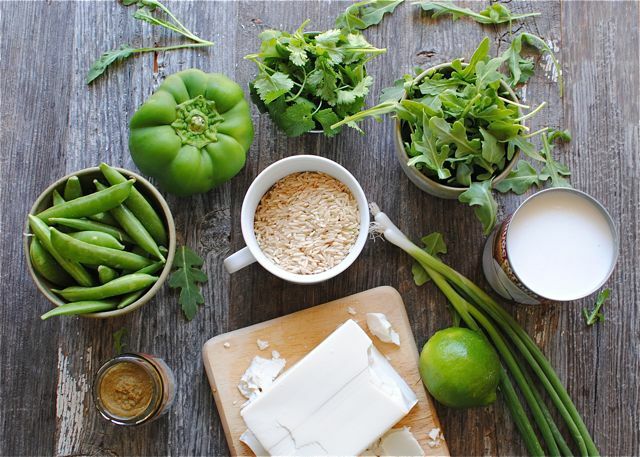 Serve the curry over brown rice, garnished with the cilantro sprigs, remaining scallions and more lime slices. * if you have the ability to crisp the tofu in a small frying pan without having a complete nervous breakdown, then by all means, dew eeeet. Girl, I think your tofu (is that plural?!?) are LOV-ER-LY. :) I admit that I'm crazy allergic to curry, but this LOOKS delish! Thaaaaank you for the tip! This is exactly what I do! 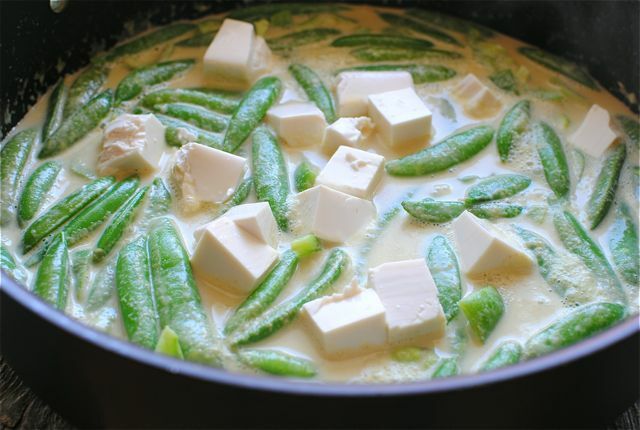 Or, if I don't want to bother with frying the cubes, I'll just buy soft tofu and soak it extra long in the curry for some really creamy, luxurious flavors.. just like in the restaurants! I do the same thing. Never thought of the irony of using a steak knife. Ha! The brand / type of tofu you buy totally makes the difference. If it comes shrink wrapped in a hard carton, you're good. If it is in more of a paper carton, well, that stuff works for me. I mean that stuff NEVER works for me. I have a pathological fear of tofu for some unknown reason - I think that's something I need to get over very quickly…because this. This needs to be made. Yummmmtown. My local Wal-Mart in my small town happens to sell already cubed tofu, it is awesome. Also, sometimes it helps if you press the tofu to get out the extra liquid before you cook it. You can buy an actual tofu press, or wrap the tofu in an absorbant towel, and put in on a plate with something heavy on top such as a big book. Do this for at least an hour and it will change your life. I was going to say press the tofu. Its a miracle worker. That should be "put it on a plate" not "put in on a plate" I really should proof read my stuff. Grammer foul. omg crumbling tofu is the worst. I know pressing it makes it better...but you still have to successfully get it out of the package first. so annoying. dude, the only tofu i can stomach texture-wise is silken and that's when it's in a pudding with lots of chocolate to mask it all. you're a brave woman for even making anything with tofu as far as i'm concerned! I'm not gonna lie. I'd prefer the Cymbalta to the tofu and I can promise you that opening a box of Cymbalta is easier than opening tofu. Also, a friend of a friend told me that deep fried depression meds are ah-may-zing. This sounds so freaking scrumptious! Yum! I used to dislike tofu. Wait, that's not fair. The truth is, I just never "got" tofu. It's a neutral texture with a neutral flavor. But all of that was before I learned that letting the flavors of the dish soak in to those little tofu sponges is a glorious thing. Now I love it. In fact, my beloved hot & sour soup would not be the same without it. I use the same method mentioned by dearabbyleigh. Works every time. That said, there are still days when I might prefer that Cymbalta & scotch. O M G! These look ridiculously awesome!! I've tried really really hard to like tofu but I can't eat it! I think that's where you went wrong...you did buy extra firm, but I think you bought silken extra firm! Which I'm sure you know at this point. Anyhoo, definitely look for the plastic packages that have a film on them, I generally find them in the produce section. This dish is what is going to push me over the "I fear tofu" edge into actually trying it. I love curry and must try this. Thank you! haha, I know what you mean! I have to admit that I usually toss the unsightly pieces! I deep fry that tofu into perfection everytime! 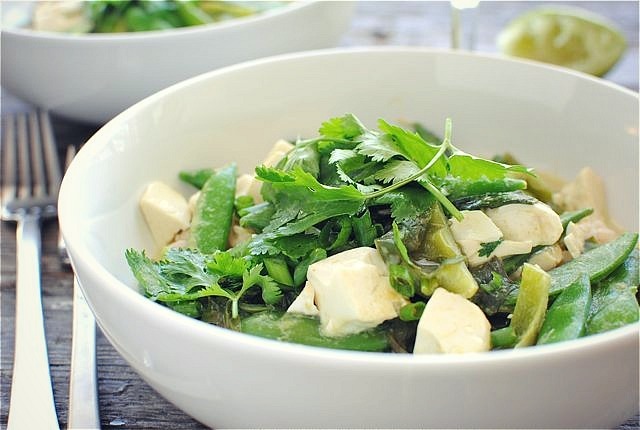 I am not huge on tofu, but this looks so good! 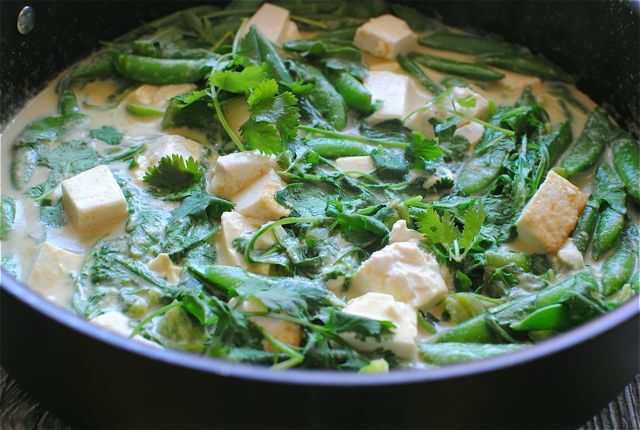 I love coconut and green curry, I just want to drink it! Shoooot look at that! I needed that. I absolutely loved your thai green curry so I'm sure I'll love this just as much! I've also struggled with the sheer impossibility of opening tofu and it being recognizable later on. A delish substitute that I've used is paneer- it soaks up flavours just as well, is way easier to work with and has a great (fully formed) texture. Might be worth a shot? THAT is a great idea. I love paneer! I have to be honest. I don't think I've ever seen it in my store, but now I'm going to be on the most annoying and insane mission ever to exist. Thank you! I also suggest pressing. You don't need to do it for a super long time but it helps it stay together. I like to get those nice crispy edges too for when I use it in stir fry and it is really easy to pan fry with just a little oil if you press it then cube it. I also read if you give it a light dusting of corn starch you can get a nicer crust on it. Hi, I really enjoy your blog and I was so excited when I saw the title of this post and I can totally relate to your frustrations. I just got a TofuXpress http://www.tofuxpress.com/ for my birthday and it has been life changing! Haha seriously I was going through entire rolls of paper towels trying to fully drain my tofu... I have so many times had the exact same thought of how in the world do restaurants get their tofu SO perfectly golden and crispy?!? So after spending a lot of time experimenting, here is what I would suggest: 1. buy extra firm tofu (in plastic containers) and press for at least 30 minutes (longer is okay but even 30 mins helps a ton) 2. slice into rectangles, sticks, or cubes (bigger shapes stay together a little better and are easier to flip) and pat dry with a paper towel 3. heat a non-stick pan to medium-high and put the tofu right into the DRY pan and cook about 10 minutes on each side until golden! This is the greatest way to get it crispy and golden and delicious that I have found! The tofu doesn't stick to the pan and I have found that using oil in the pan just makes the tofu wet and soggy again and it doesn't ever get crispy. 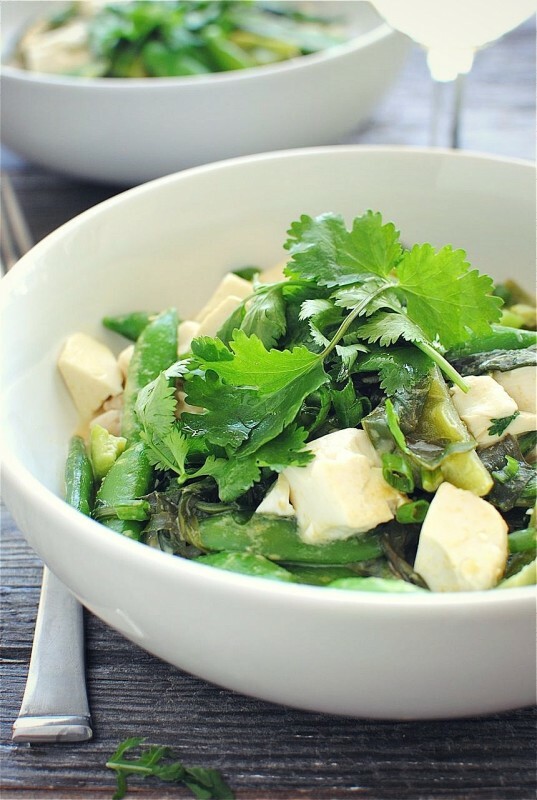 For this recipe, I would cook the tofu as above and then add it to the curry sauce and veggies at the end and give a few minutes to warm/absorb flavor. Can't wait to try! Um, you have just made my entire life. THANK YOU. I hope the glass of wine in the picture helped you feel better from all that tofu stress. Lol! Looks like Rachel has a good remedy to make tofu crispy that I am going to try. yup. THIS is why i don't make tofu at home anymore. it never turns out how I want it, which is apparently only deep fried. does that take out the healthy? i don't think so. I think if tofu were deep fried I'd be willing to eat it lol. My mom tried cooking it many times for my brother after he went vegan (now vegetarian) and it was never a pretty sight! I was all ready to say that the only way I have ever gotten tofu crispy was by full plunge deep fat frying- but thank you to Rachel above! That curry sauce looks so dang good. I just love curry Bev- thanks! I love tofu, it's the chameon of the culinary world. I pan fry my tofu, and use a splatter cover over the skillet(a great investment), 'cause it will splatter all over. There is also precooked tofu in the produce department that has a meatier texture, for those who don't like the jiggliness(?) of tofu. Really like that you add arugula! Okaaaaay, SEE, thank you! I get it now - the SILKEN vs. regular. You've opened mine eyes. I don't think "mine" is right here, but who cares? Thank you! This was delicious on a cold winter's night. Thanks for sharing! I freeze my tofu & then defrost it before cutting & pan frying it. It makes the texture a lot easier to slice through to make those perfect little cubes for frying. : ) Can't wait to try this recipe! I know one other commenter mentioned this, but it is clear from the picture you are using silken tofu, not regular tofu. Use regular tofu, preferably organic and non-GMO. Wildwood makes great tofu. Regular tofu does not come in a box typically, but silken does. Don't let the "extra firm" label make you think it is regular tofu. There is such a thing as extra firm silken tofu but it's still silken. Frying regular tofu is easy. Try a marinade of equal parts mirin and cornstarch first. Please keep making recipes with tofu. I eat plant based and there are wonderful things to be made with tofu. It is an acquired taste (as is quinoa), but once you get the taste for it you'll love it. I plan to make this recipe tomorrow night. Hi Bev, I'm new to discovering your blog. It's pretty clear that you should keep the "self-proclaimed" bit in your title, "self-proclaimed foodie." You lack pretty basic tofu knowledge, but it's good you're starting somewhere. Learn from your readers. Good luck!